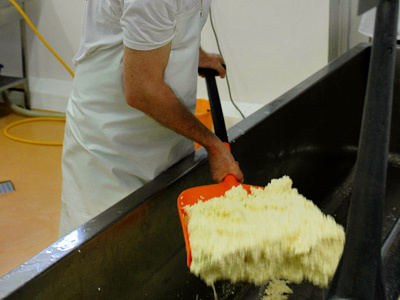 All our cheese is hand made using local, unpasteurised milk - remember, it’s the only Cheddar made in Cheddar! There are many stories (some more believable than others) about how Cheddar cheese originally came into being, but some facts are not in doubt. 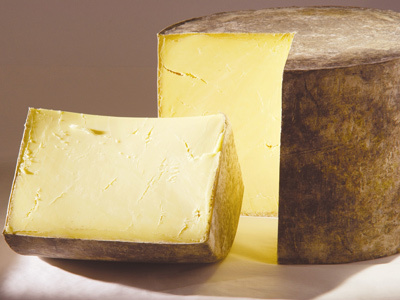 The land around the village of Cheddar has been at the centre of England’s dairy industry since at least the 15th Century with the earliest references to Cheddar Cheese dating from 1170. With the absence of refrigeration or adequate transport the problem of what to do with surplus milk was solved by turning it into cheese. Cheesemakers discovered that if you pressed (squeezed out moisture with a heavy weight) the fresh curd, the cheese lasted much longer. 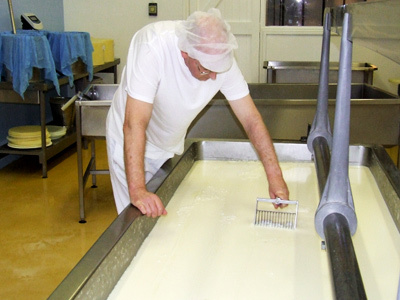 This method of cheesemaking along with other refinements was perfected in the Cheddar area and so the first authentic Cheddar Cheese was born. Matured in cloth for up to 18 months to produce a rind and, more importantly, to allow the gradual change in texture of the cheese to take its effect on flavour development. This happens differently in vacuum matured cheese. Here at The Cheddar Gorge Cheese Company, we continue to make cheese in this way and are alone in keeping the traditional art of Cheddar making alive in the heart of the village of Cheddar. Our cheese has won many prizes at the British Cheese Awards, The Royal Bath and West Show, Nantwich International Cheese Show, Frome Cheese Show and "BEST CHEDDAR IN SHOW" at The World Cheese Awards. Queen Victoria was once presented with a drum of lovely Cheddar that weighed 11cwt (558kg), formed from the milk of over 700 cows. We are the only cheesemakers left in Cheddar. The whole process takes around 8 hours from start to finish. You can watch us during the various stages as we transform our rich, local milk into award winning authentic Cheddar Cheese. Our viewing gallery allows you to watch our cheesemakers practice their skills, a DVD is also playing throughout the day to enable you to view the process from start to finish in about 20 minutes. From Easter until the end of September a guide is on hand to help and answer questions and knowledgeable staff in the shop during the rest of year. After seeing cheese being made you can treat yourself to a free taste at our taster bar and then visit our shop where our Cheddars plus local pickles, biscuits, hand crafted cheese dishes, cheese knives etc are on sale. 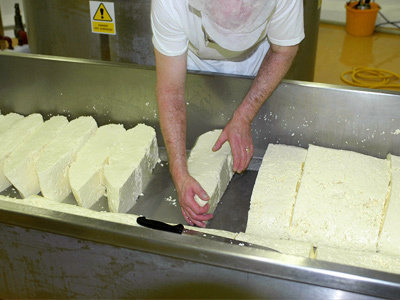 Admission to the cheese making area is £1.95 for adults. A maximum of two children per paying adult under 16 are free. Coach parties are welcome throughout the year and there is a group booking discount for parties of 15 or more. A guide can be made available subject to prior notice being given. We close the Visitor Centre for groups of 30 or more to give you our undivided attention and therefore we do charge for groups of children under 16.